A few weeks ago I was listening to a wildlife photography presentation on youtube by Robert O'Toole and he mentioned Focus Tracking with lock on. I had no clue what he was referring to so I decided to look into it. 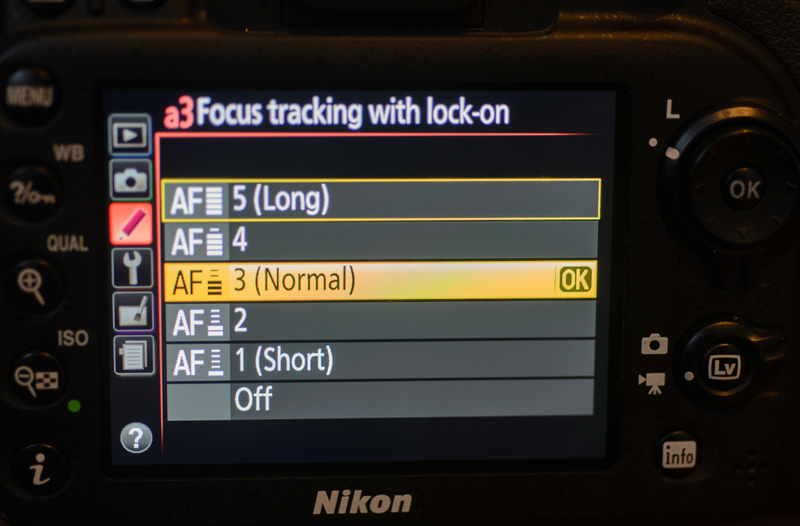 It turns out on most Nikon cameras there is a setting under the Custom Settings Menu called Focus Tracking with lock on (Setting A3) on my Nikon D7100. By default this setting is set to 3(normal). So what is this setting? Well it is meant to help control the time in which the camera tries to refocus. So for example if you lock onto a bird inflight and it passes behind a tree or another object for a brief moment the camera in many cases will lose focus on the bird and try to acquire focus on the tree or other object. Its not often that I've had a subject that has passed behind an object but it got me think... When I'm tracking a bird especially now at 700mm it is hard to keep the single focus point directly on the bird at all times thru out its flight path. Sometimes I move up or down and the camera decides to focus on the BG in turn losing focus on the bird. By the time I get the point back on the bird its too late and the moment is gone. So I've decided to put my Focus Tracking with Lock on setting to 5(long) and see if this aids at all with retaining focus even if I slip the focus point off the bird for a brief moment. Through out the morning I felt I was getting a lot more keepers then I have before. Can I 100% say it had to do with this feature? Definitely not...but I can say for sure that it certainly didn't make things worse for me. I will continue to keep this setting at 5 and do more tests. I've tried doing some research on this topic but haven't found much. The few posts that I have found on the Internet seem to be more in favor of turning this setting off as they claim keeping it on or even turning the setting higher causes a delay in focusing and can result in out of focus shots when shooting in bursts. They state that if the subject distance is changing (for example a bird flying towards you) the setting will cause the camera to be delayed in tracking the bird and result in missed shots. On or Off? Its hard to know which one is right. Maybe its something you might consider trying? See if things improve for you..if you do please let me know what your results are and your thoughts on this setting.